European Southern Observatory (ESO) officials have finally confirmed that they have discovered a new exoplanet candidate named Proxima b inside the habitable zone of Proxima Centauri - a red dwarf star in our closest neighbouring star system, Alpha Centauri. This is gigantic news, because it means an Earth-like planet could lie just 4.2 light-years away from us, and has the potential to support life. Further research is needed to confirm the characteristics of its atmosphere and the possibility of liquid water on its surface, but the team already has plans on how to get us there. "Many exoplanets have been found and many more will be found, but searching for the closest potential Earth-analog and succeeding has been the experience of a lifetime for all of us," team member Guillem Anglada-Escudé from Queen Mary University of London told the press today. 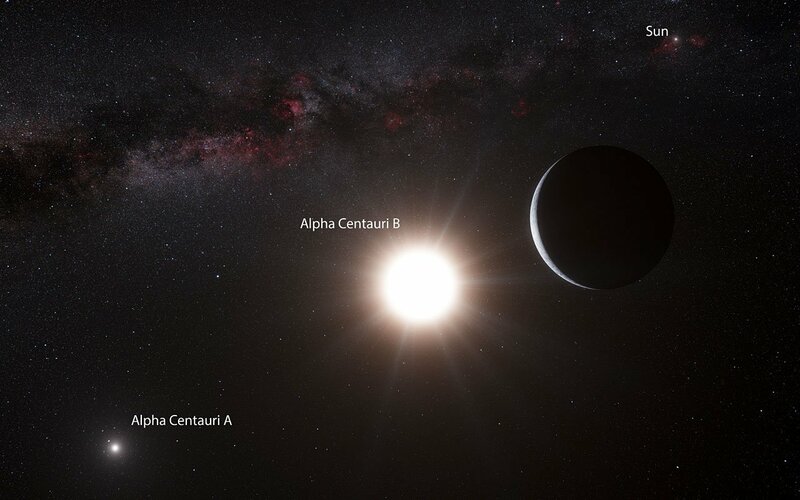 Named Proxima b, the exoplanet candidate orbits Proxima Centauri - a red dwarf that lies within the Alpha Centauri star system in the constellation Centaurus. This is the closest star system to Earth, making Proxima b the closest Earth-like exoplanet ever found. "It’s really exciting because the proximity, it can’t get any better," said one of the team, Michael Endl, from the University of Texas at Austin. The team, which includes researchers from the ESO and a program called the Pale Red Dot campaign, was able to find the new planet candidate by observing Proxima Centauri during the first half of 2016, and comparing their data with previous observations from the past 16 years, collected by telescopes all over the world. In collating 16 years worth of data, they found enough statistical evidence for the existence of Proxima b. "I kept checking the consistency of the signal every single day during the 60 nights of the Pale Red Dot campaign. The first 10 were promising, the first 20 were consistent with expectations, and at 30 days the result was pretty much definitive, so we started drafting the paper!" said Anglada-Escudé. What we know about Proxima b so far is that it's roughly 1.3 times the size of Earth, and there's a good chance it's rocky. It orbits roughly 4.3 million miles (6.92 million kilometres) from Proxima Centauri, and takes about 11.2 days to complete its orbit. Its surface temperature is about -40 degrees Celsius, and there's also the possibility that it harbours a survivable atmosphere and liquid water on the surface - something that would be key for life to form on the planet. Further observations are needed to confirm this, but fortunately, the team says Proxima b is in range of probes, which means one day in the not-so-distant future, we could send a spacecraft out there to take pictures. The research team also plans teaming up with Mark Zuckerberg, Stephen Hawking, and Russian billionaire Yuri Milner, who already announced a US$130 million project called Starshot earlier this year that will send tiny spacecraft to Alpha Centauri in hopes of finding life. The Starshot team hopes to get their tiny spacecraft out to Alpha Centauri within the next 30 years. As their project continues, as well as the ESO’s, we will hopefully figure out much more about Proxima b. "Proxima b is indeed our neighbour," says the team, "so let us get used to it." The team's findings were published in the journal Nature.